Do these exercises and you won’t only get an athletic chest. No, you will take many more muscles up a notch too! An isolation exercise is an exercise that targets one muscle. When you do biceps curls, for example, most of the work comes from your biceps. A compound exercise, on the other hand, targets one muscle but takes a number more along for the ride, the so-called “synergist” muscles. When you do chin-ups, to stay with the biceps example, you get a lot of work done by the biceps, but also by your lats, upper back and forearms. That’s why won’t find a chest isolation like dumbbell flyes in the below list. Leave isolations for the time when you need more emphasis on one target muscle. The most simple and beginner friendly compound chest exercise is the push-up. It doesn’t require any equipment to get started with and you can adjust the difficulty to what you need. Beside the main and upper portion of the chest, they also train the front of your shoulders and your triceps. Your chest consists of two muscles you can train separately: the sternal and the clavicular, commonly called the “main” and “upper” chest. 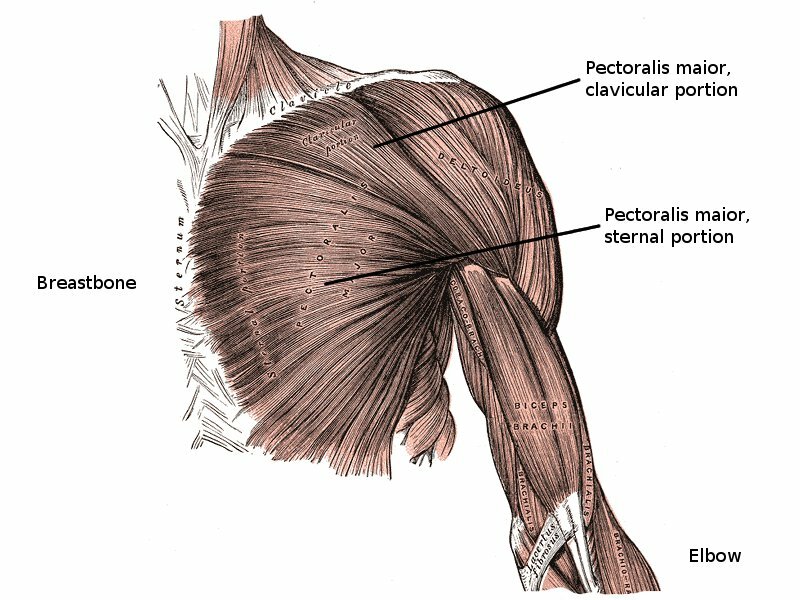 The main (sternal) and upper (clavicular) muscles of the chest (pectoralis maior). The easiest method of targeting the upper chest is by grabbing a chair and doing declined push-ups. The synergists working along are the same as with regular push-ups. When you get tired of push-ups, the dumbbell press is a great alternative. The muscles they work are the same as with push-ups. If you don’t have a bench at home, you can do them on the floor, like I do in the video. This limits the range of motion a bit, but not to the point where the exercises is useless. I also find that hyperextending the shoulder (by doing dumbbell presses where the elbows go below them) makes injuries more likely. These will work the upper chest like their cousin, the declined push-up. As with those, you get the same synergists working as with their flat relative. I’ve had comments about the board breaking and how much better a real bench would be, but no. Cheap benches are usually made with particle boards. If you use a solid board like I do, it’ll actually be superior. When you do this exercise for the first time, you’ll wonder about the strong sensation of your chest and lats working. Beside those two, your neck, triceps, rear shoulders and middle back also get a bit of the action. Great! This is almost the same workout that I did yesterday at home! I just need to add pullovers the next time.